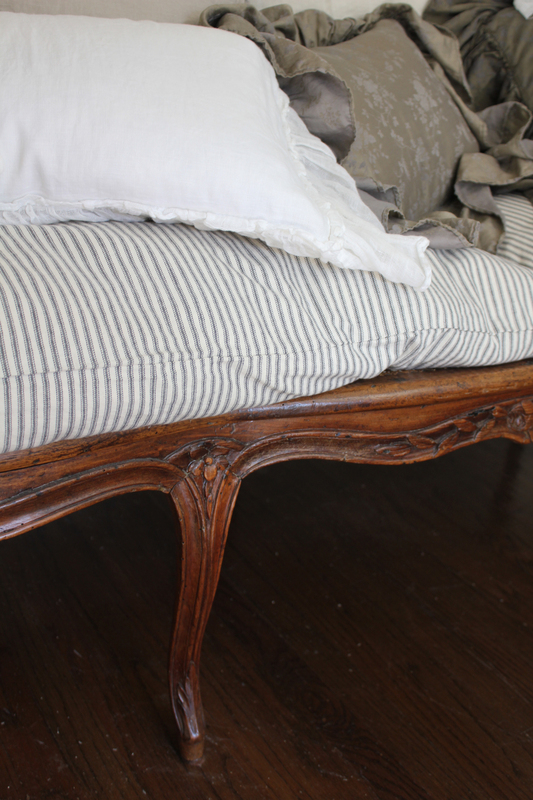 For those of you that prefer your vintage linens brand new…..I thought I should quickly mention that this is the final day of Matteo’s February Web Bed Promo here. My canape above sports two of their black ticking king size pillows in “greige”. It’s light weight cotton, zippered along one long side. 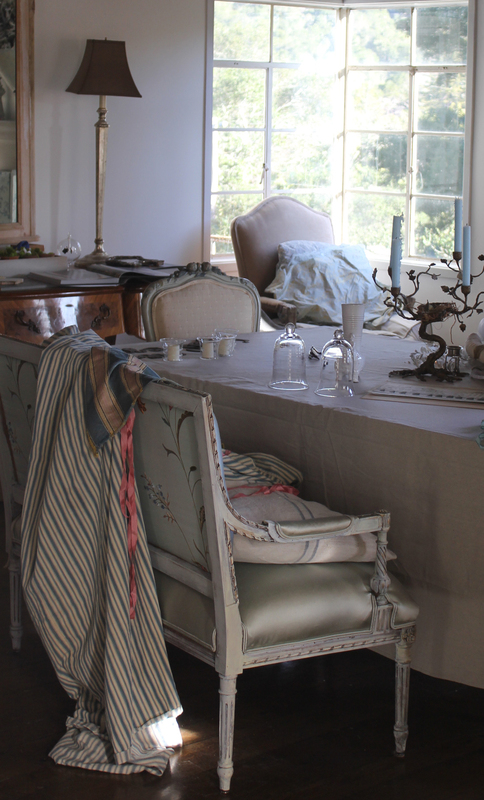 That gorgeous embroidered linen sheet in the background is from our fellow blogger and antique dealer and gardener extraordinaire Karin of La Pouyette. Since I first held it in my hands…it has never seen the inside of a closet! Thanks again, Karin! 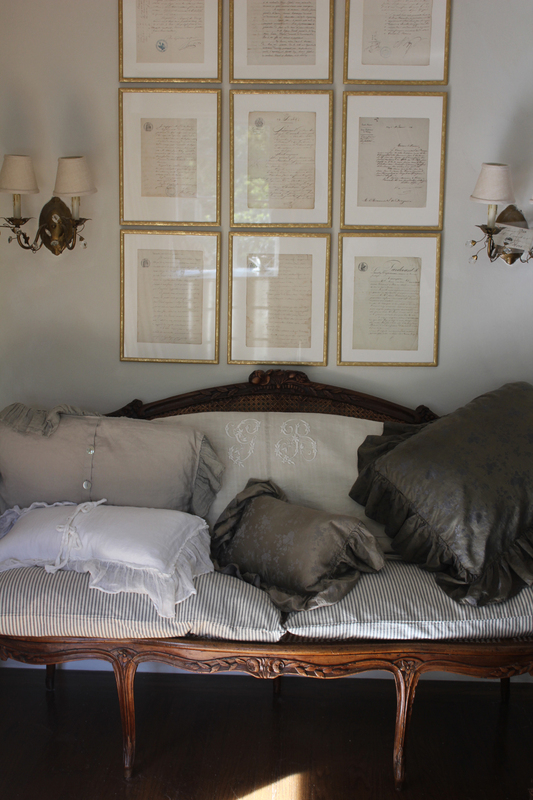 I’ve posted about Matteo bedding before in my Linens to Dye for post here. I confirmed with Matteo that the photo above is the “greige” black ticking. At 30% off, it makes a nice little dent in the price. The ticking looks a little lighter here…awash in February sunshine! Ticking tones down florals and bumps up neutrals. I’ve been trying to work a few stripes into my decor, so dragged out a few collected antique and vintage pieces to sketch out an idea. 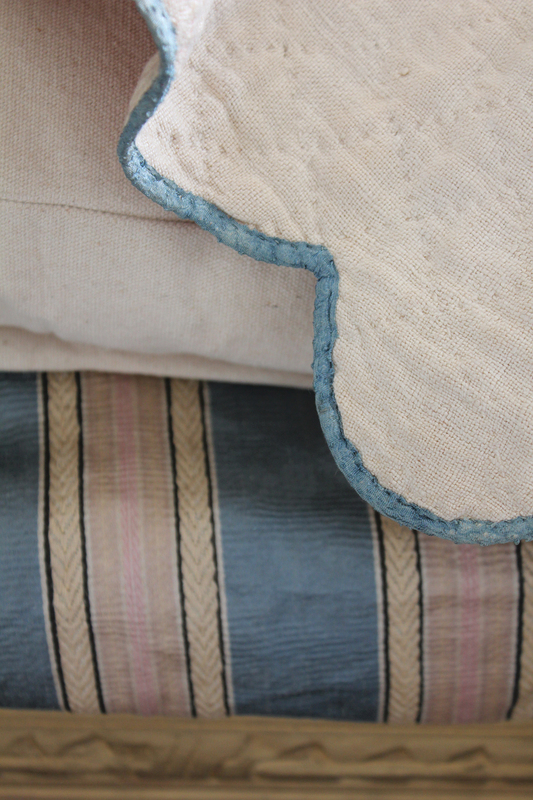 This vintage mattress ticking has a nicely aged blue and ecru stripe. Can imagine it brought out a bit on the edges and lined with a nubby French linen sheet. 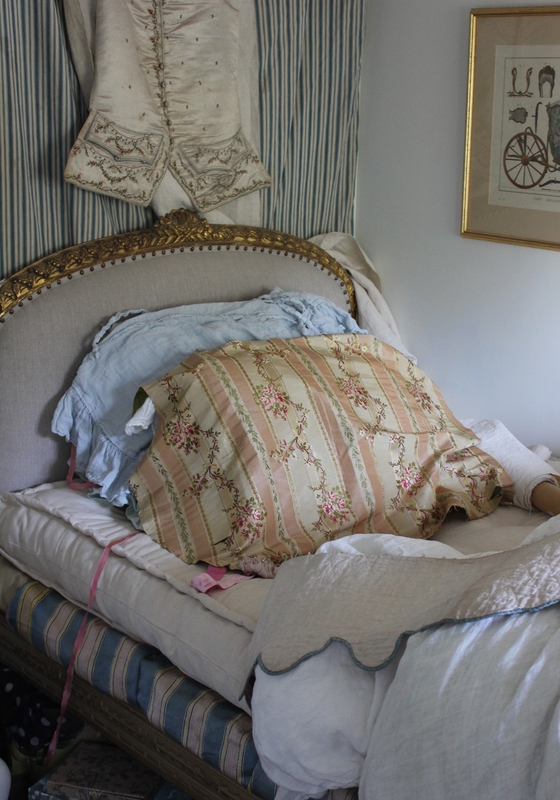 I tucked a set of striped blue, pink and gold vintage cotton scraps under the French mattress. I’ve been wanting to use the two striped patterns together since purchasing them several months ago. 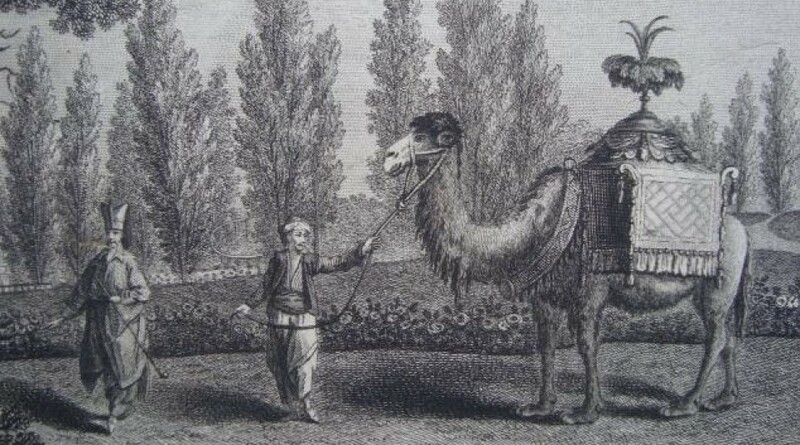 The peach striped floral silk is 18th century French and delicate. It could either be the underside of the bed hanging…trimmed with the blue edged linen pelmet…or I might risk a pillow. I just purchased this floppy 19th century linen from the Textile Trunk to line the ticking. Really…a good photo get’s me every time…(yes that’s Wendy’s home in the background!…love that greige wood wainscoting!!). In the textiles I collect I adore pattern…but in decorating I have to dilute it with copious amounts of textured neutrals!! 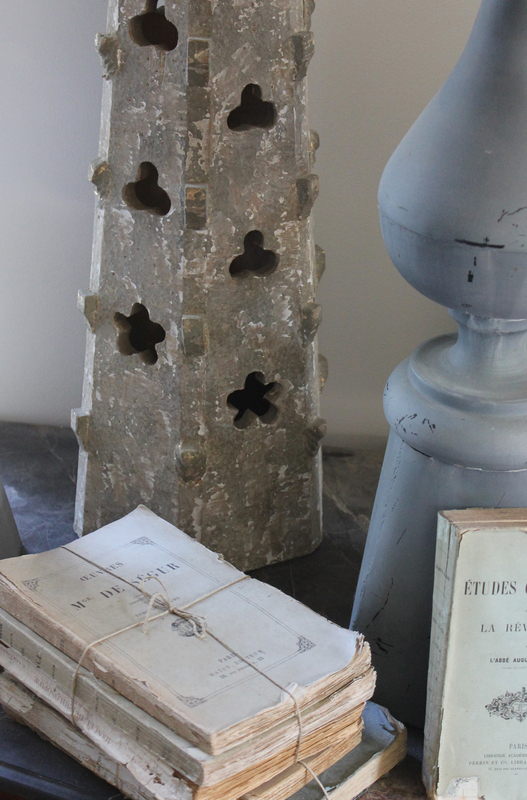 All my vintage flea market finds…or flea market knock offs like the Aidan Gray pulpit spire above…are the little bits I use to try to add texture to my very neutral decor. (I picked up the vintage paperbacks from our friends at Atelier de Campagne here). I’m no longer apologizing for keeping my walls neutral. I love light filled rooms…and a tweak of vintage accessories and textiles can add the drama. If you’re a purist…there’s an incredible grouping of 18th century French chapel parts at Ambiance Antiques here which I have seen in person and wish I could squeeze into my home and budget! Wonderful! Just a quick glimpse into what I’m sketching out at home….more on ticking later….